Surfers at Rainbow describe encounter with whale: These two Victorian surfers don't believe the whale, that one witness from the beach believed to be caught in nets think the whale is not actually caught, just confused by the presence of the net. UPDATE: Surfers believe a whale that was thought to be caught in shark nets is not actually entangled, just confused by the presence of the net. They spoke with Gympie Times reporter Arthur Gorrie at Rainbow Beach. Former whale watch tour guide and wildlife advocate Jennifer Parkhurst said the whale appears to be a sub-adult and while it may not be physically entangled, it is effectively trapped inside the nets and can't find its way back to the open ocean. "It's distressing to see it in trouble like this. The nets should be taken down during the winter when it's whale watching season," Ms Parkhurst said. Another Rainbow Beach local, a para-glider instructor, echoed these sentiments and said he often saw whales and sharks inside the nets from the air and said the nets offer a false sense of security. Ms Parkhurst took the following pictures and video of the whale. 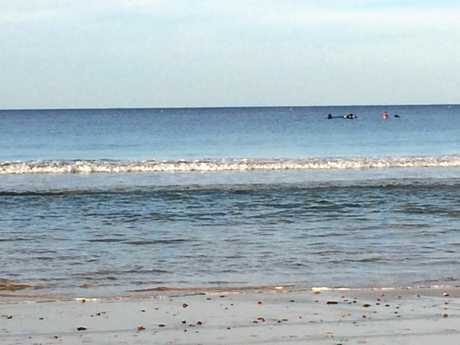 A WHALE has become stranded in shark nets of Rainbow Beach main beach. Marine rescue have been contacted and are en-route, but the whale, visible from the beach and the surf-lifesaver's tower, seems to have become entangled in nets designed to keep swimmers safe from sharks. A witness said he saw the whale around 4.10pm come out of the water a little but then it appeared to stop and is now not moving. He said he knows it is still alive because every so often it emits a spout from its blowhole. The witness speculated that the whale had been swimming inside the nets close to the beach but became entangled when it tried to return to deeper waters. The witness also said a number of surfers were also in the vicinity but he said he was not sure if they would be able to attempt a rescue. Whales migrate past Rainbow Beach every year between June and November. Whale trapped inside shark nets at Rainbow Beach: Watch the distressing footage of a sub-adult whale caught inside the shark netted swimming area at Rainbow Beach, unable to find its way back to the open ocean.